Introducing the founding members of this humble farm. . .
Lorelei and I have been together for a decade. She and I found each other through an Opelika Newspaper Ad in the Classifieds via a listing for free kittens. When I arrived to the scene, she and her siblings were in a cardboard box sitting in the sun with no water and were covered in fleas. My heart melted for her as she sat panting in the heat of Alabama in August. Here we are 10 years, 6 homes, 3 states, and 2 cross country drives later. Lorelei was there to see the last of my teenage years, my 21st birthday, college graduation, moving across the continent (and back), leaving a sleepy college town for a bustling city and then to the middle of nowhere, starting multiple businesses, quarter life crises, healing, growing, and the endless chasing of dreams. She is most definitely an independent lady, preferring the company of few. Not many folks understand her, but she will always have my ultimate respect for the amazing companionship she has shown me throughout the years. My girls. Goldie, Magnolia, Mrs. Brown, Mademoiselle, and Angie. These ladies were once in the care of an amazing fellow shepherdess named Kirsten, who I happened to meet through a fellow acquaintance. She was downsizing her herd of over 80 alpacas, and I had the honor of purchasing 4 of her favorite girls and 1 adorable male cria. 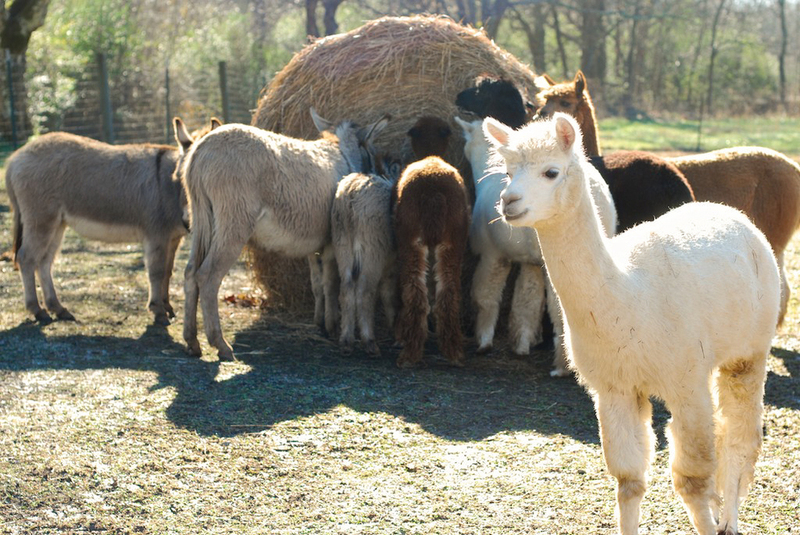 Each member of this camelid clan has a distinct personality and a unique way of interacting with the herd, their fellow pasture mates, myself, and other humans. Goldie is pretty passive on all accounts. She is happy to follow the other ladies around the pasture without much interference of Mrs. Brown's ultimate reign. She will immediately sit down when I approach her to do any type of toenail trimming, vaccinating, or general health checkups. Her fiber is absolutely gorgeous: silky and light, and to me it feels like spinning the sunset. I have had the honor of hosting Bill Watkins as my shearer since I began this journey. Through working with him I have learned a great deal about the alpaca industry, fiber quality, herd health, and responsible farming. It was with great delight that I listened as Bill commented on how wonderful Magnolia's fiber was upon seeing her for the first time. When Magnolia moved to the farm, she was less than 8 months old. That first winter she could not put on weight, so I loaded her in the back of my station wagon and drove her to the closest vet who would agree to see alpacas. He promptly shoved a syringe of neon blue liquid down her throat and advised me to keep an eye on her. To this day I have no clue what was in that syringe, but whatever it was, Magnolia started to gain weight and began to show her incredibly outgoing and inquisitive personality. She is one of the first girls out of the barn when they hear me walk into the pasture, always at the front of the pack to meet a random dog who happens by the fence along the road. Mrs. Brown has the biggest personality on the farm. She is by far the alpha female, leader of the pack, and ultimate sass potato. For one reason or another, Mrs. Brown was bottle fed and completely spoiled by her previous owner, and thus carries herself with a bit of an attitude. Surprisingly, she is pretty accommodating to visitors, allowing folks to come up and pet her most of the time. Mrs. Brown can be heard making all sorts of noises from the pasture, which caused quite a stir from my new neighbors for the first few weeks after we had arrived in Tracy City. Despite my routine herd health checks, Mrs. Brown is always known to make quite a fuss during vaccinations, worming, and toenail trimming. Mademoiselle, or Madame as I call her for short, is the oldest and most reserved lady on the farm. She was about 5 years old when we met, and quite independent. Kirsten commented that although she was a bit stand-offish from people, her midnight black fiber was gorgeous and she was a "good keeper", explaining that she maintained a high quality of health without too much human interjection. Both Madame and Angie absolutely love the water hose. During the summer months these two ladies will literally dance at the sight of running water. Each dance is most amazingly unique. Angie is a dream alpaca. She is calm, logical, and easy to handle. At one point in her life, Angie was a reserved grand champion in a show ring. She won several ribbons from what I hear. I have never put any of these critters in a show before, but I can see why someone would want to show Angie off. When she isn't covered in leaves she grazes in the pasture like a peacefully floating cloud. Bringing these girls home for the first time was a mixture of terror and delight. The thought of these beautiful creatures leaving the care of a seasoned veteran farmer and into the hands of a complete novice brought me an overwhelming sense of purpose and determination to make it work no matter what. After almost 4 years of being a shepherdess, I am honored to have these ladies make up my founding herd. I will not only be forever grateful for the knowledge I have gained about veterinary care, animal husbandry, and overall farm management, but also the true definition of dedication, perseverance, and living life with an ultimate passion. My girls have shown me endless compassion as I stumbled my way through that first winter season, as I crawled my way up the learning curve until reaching a level of proficiency only gained through diving right in and experiencing farming first hand. These girls + Lorelei make up less than half the menagerie here at the farm. Keep in touch, I'll introduce everyone else here soon.